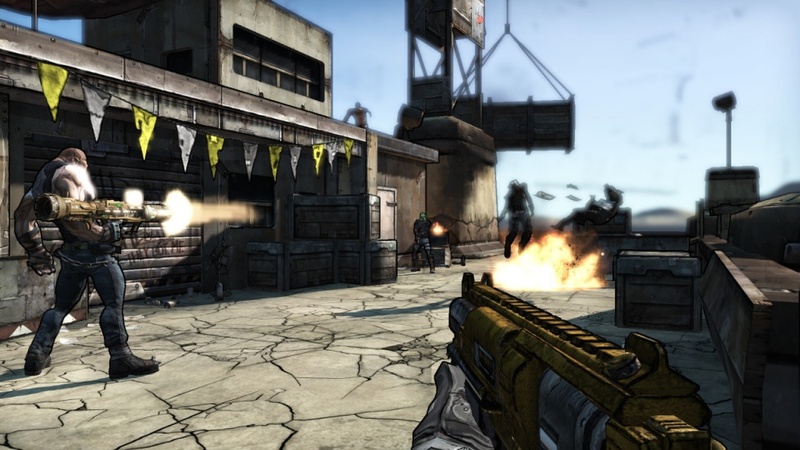 Co-Optimus - News - Borderlands Details: Co-op, And Gameplay, And Weapons. Oh, My! While we're not entirely sure if a demo is on the horizon, we have a nice juicy preview of Borderlands to intrigue us in the meantime. Gearbox's own CEO and co-founder Randy Pitchford spoke with IGN about the game, and what to expect from an inside perspective! 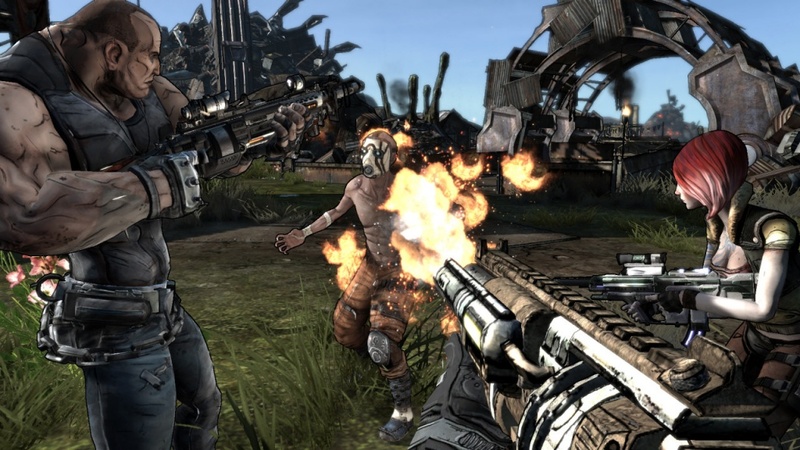 Borderlands will include gameplay elements from a sci-fi style first-person shooter, and a Diablo 2 style RPG. Blending these elements seems so natural, and Gearbox was ready to take it to the consoles. Randy Pitchford was as excited about creating this blending of styles, as we are to get our hands on it! "From a design point of view, the bet we're really making here and the goal we have is to take the visceral, accessible action that we love in first-person shooters…and connect it with that compelling and almost compulsory kind of joy, accomplishment, and satisfaction we get when we can get better stuff and loot. And it's not just loot, it's also character growth like developing new skills and becoming more powerful. That exists in games like Diablo and World of Warcraft…and no one, I think, has really blended these concepts together the way we are." 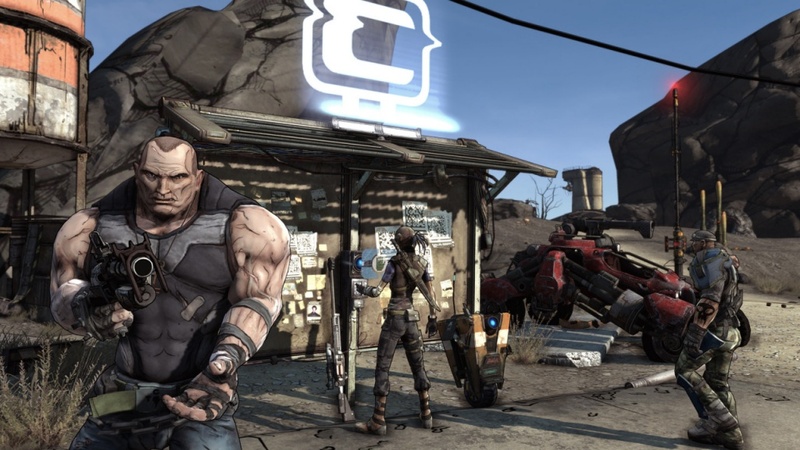 Gaming your way around Pandora, the world of Borderlands, you're virtually expected to co-op. Drop-in, drop-out co-op that bases part of it's lifeblood on Diablo 2 style gameplay demands it! 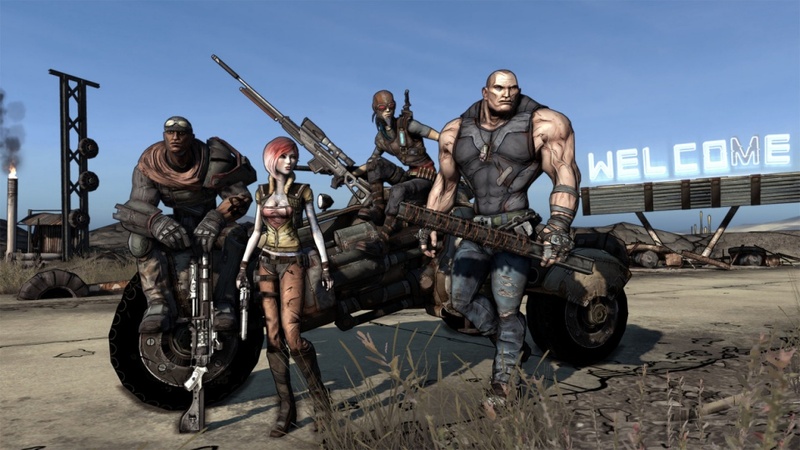 Gearbox was also prepared to work out all the kinks to bring the co-op to life as smoothly as possible. "When you think about the questing and the loot aspect of it and the growth aspect of it--obviously Diablo is a big reference there, and when we think about Diablo, you had your four players that were able to play co-op, but we also wanted to do better than that. I remember, my experience when I played Diablo, I got the game and I played single-player for a long time and then I said 'Let me try going online,' and [Blizzard] divided those two concepts. When I finally decided to go online I had to start over and I had to create a different character. So I said, wouldn't it be neat if your character was persistent and you owned that character, and if you wanted to play in single-player you could, and if you wanted to take that character online you could, and if you got anything there you could take that back into single-player. Or at any moment a multiplayer game could become a single-player game because everyone's dropped out, or at any moment your single-player game could become a multiplayer game because you're inviting your friends in or you're joining somebody else's game. Wouldn't that be amazing if the game was that flexible and your character was persistent? That was a goal from the beginning." Drop-in, drop-out co-op needs to have some incentive to work together. For Borderlands, one of those incentives is a tougher enemy group. Increased challenges in a game that rewards you for being challenged. Yes, please! "Let's say I'm playing and I invite you to join my game. When you spawn in the world, we'll both get a message saying 'You've joined the world' and then it'll say 'The enemy has become tougher.' Then what happens is there'll be more enemies, the enemies that we find will become more challenging, and they're challenging not to make it frustrating but to balance the fact that we have more power and capability together. The rewards increase too, we'll now be able to share more experience from the enemies we take down and get better loot from them, more loot from them too." For those that need their split-screen co-op, Gearbox brings it to you! As of right now, the split-screen isn't able to visit online, but they're working on it. "You can play on your system on both the PlayStation 3 and Xbox 360 and you can join people online or you can have a friend play with you in a split-screen scenario, but right now we're not able to bring the split-screen online. Maybe we'll be able to find a way to do that later, but that's a technical limitation with the amount of data that's going on it just can't work. That would be something that we'd love to do, and I hope people love the game so that conceivably we could invest in that and find a way." As with many RPG style games, there will be a fair amount of level-grinding. According to Gearbox, they've worked in a system to make this less of a chore, and more exploration in level-grinding specific areas. This massive world shows no end to the exploration possibilities, and Randy Pitchford is ready to encourage us not to be afraid of leveling up a bit. "Imagine a big world and there's little places in that world where you can access other sublets, we call them doglegs, or connect to other big worlds. I think from the gamer's point of view you're going to feel like, at the beginning you have access to the town of Firestone and you're exploring that, but as you progress the world starts to feel larger and larger because you feel more capable of venturing out and become more aware. Very early in the game you're challenged to deal with this villain, this bandit leader known as Nine Toes who's been harassing the town. To get to where Nine Toes's lair is you have to go through this place called Skag Gulley. Skag Gulley is a dogleg, so you'll access that off the main world and it'll do a brief load and then you'll enter into that. It's like an instance in World of Warcraft and inside that is where you'll find Nine Toes' lair." Without a demo, many will be curious how this game will actually play. 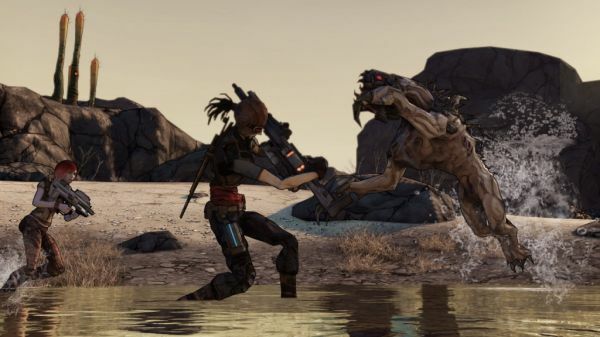 In theory, an RPG based shooter is a great idea, but we still have a few questions. IGN asked that question, and got a pretty specific answer! "If you take Halo and how it feels to move your character around, and aim and pull the trigger and the way the gun feels in your hands and the way it fires, it's just like that. But now imagine when you've done that a little bit, wow I just leveled up and I've got more health and I've gotten skill points. Now I can choose to be a really good armsman and reload faster or I can choose to be a medic, depending on which character class I've chosen each of them has multiple builds, and I'll build my character out with the skills I develop throughout the course of the game." 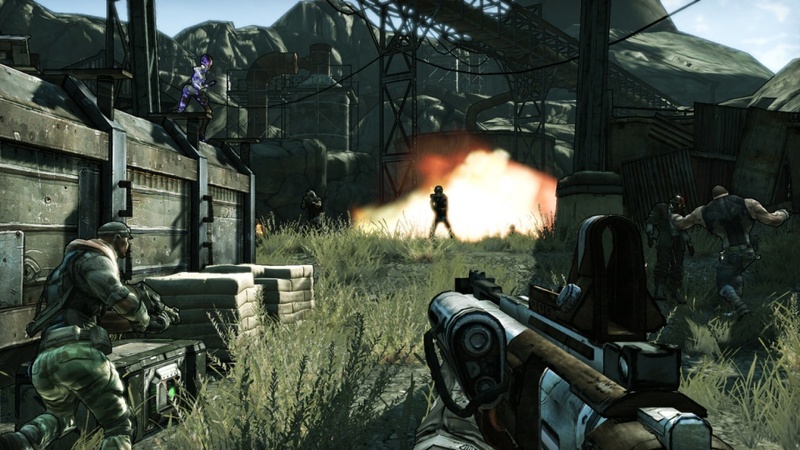 Oh dear, we almost forgot about the massive arsenal that brought Borderlands to our attention to begin with. IGN isn't the only one curious about it, and we get quite a bit of information out of this one! "When you play every first-person shooter you've ever played, there's the pistol. Maybe there's some games that have a few. Then the designers say 'well we're going to make this pistol the early weapon, so we'll make it kind of inaccurate. It's not going to do very much damage and it's going to have a lot of sway so it's hard to hone in on the enemy, and we're going to have it reload relatively slowly.' Halo did this thing where you can look down the sights with the pistol and it's very accurate, so there was a utility to the pistol even after you found more powerful weapons, and that was a pretty good innovation. In Borderlands, there are hundreds of thousands of pistols, and amongst them you will find something that functions effectively just like that Halo pistol, you'll also find something that's very powerful, you'll find something that functions more like the pistol from Doom 3 or from Quake 2 or from any of our games, and you'll find pistols that'll be more or less accurate, that will have faster reload times, or that have a larger magazine but have a different round in them that does more damage or a different kind of damage like an incendiary effect or maybe one that has an acid shell that'll melt their face off when it hits them. I've even found pistols with shotguns shells that has a scope on it. We didn't design each gun, we developed software and artificial intelligence to procedurally generate these things for us. So the artificial intelligence we did creates the guns for us. Each pistol doesn't just have unique stats, it also has a unique look. You'll be able to tell something about it, like this pistol has a really long barrel, I guess it probably fires more accurately…or look at the magazine coming out of the handle of that pistol, I bet that pistol can carry 50 shots before I have to reload." It really looks like Gearbox is on top of every angle possible for Borderlands, and it's shaping up to be a definitive co-op title. Bringing RPG and Shooter elements together in one beautiful package, what a great concept. We're looking forward to the October release with bated breath, and hope to get our hands on SOME kind of demo or beta before then.